A new resident of Chicago's LakeView neighborhood, Jacqueline Michon, was killed Friday night while returning from the Lollapalooza concert in Chicago. According to reports, the location of the incident was at Wacker Drive and Wabash, just south of the Chicago River. Michon was riding north on Wabash and came to a stop at a red light at Wacker Drive. This is a common area for bicyclists and other vehicles as Wabash is one of the streets that crosses the Chicago River in a northbound direction. It would not have been unexpected for a bicyclist to have been at the intersection and it is an area of the city where bicyclists are permitted riders. In fact, the new protected bike lane on Kinzie is just northwest of the river at that location. The reports further state that Michon lost her balance and fell under a truck. Apparently, when the light turned to green the truck ran over Michon. No news reports have offered an account as to how or why Michon fell. Nor have any reports accounted for why the truck did not see Michon prior to pulling away or notice that it struck a person in the roadway. Police are reportedly still investigating and no charges have yet been filed. 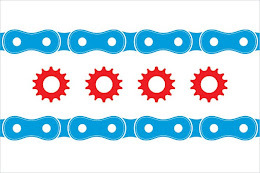 If you have any questions regarding this post or an issue involving Illinois personal injury law, please contact Illinois Bicycle Attorney Mike Keating at 312-208-7702 or MKeating@KeatingLegal.com . All initial consultations are confidential and free.